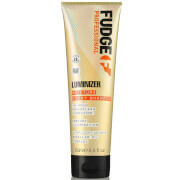 Suffer from an unwanted yellow, brassy tone with your coloured hair? 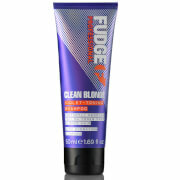 Fudge Clean Blonde Violet Shampoo will make that a thing of the past with its intelligent formula. The shampoo will balance out the tones in your hair to leave you with a colour you'll love and hair that is smooth and hydrated. The best purple shampoo I’ve ever used. Amazed how much it’s brightened my highlights. I have been using this product for a couple of years now and find perfect for my greying hair, it gives my hair a nice tone with no work of having to use a rinse so simple just shampoo and I have so many people asking what I use on my hair to give it that lovely colour, so for me it is 100% product and buying it in the litre bottle is great value as usually I pay three times that amount in my local area. Came in 3 weeks to New Zealand, was scared it wouldn't come but it came today :) super excited to use I've only heard good things about it, highly recommend! !